Home General-Herbs Grow your own Herbs – make a special cup of tea! Grow your own Herbs – make a special cup of tea! There is always something special about making your foods completely from scratch. Whether it is a delicious pot of warm organic vegetable soup or a recipe that has been handed down for generations, a special reward of fulfillment comes with growing your own edibles and then preparing them exactly as you see fit. In this way, you can be sure that you are getting the healthiest and most delicious foods possible. The easiest way to experience the fulfillment of making something out of nothing is to grow your own herb garden specifically for the purpose of making your own delicious herb teas. You do not need a green thumb at all, as many common herbs are among the easiest to grow. You also do not need a large plot of land. You can start with something as simple as a single small flower pot, some nice organic compost, a few herb seeds, and a pattern of loving attention. There are many herbs that make for outstanding teas. You can start out with the herbs that most people recognize as great for tea, such as mint or chamomile. These herbs are both easy to grow and make for delightful hot and cold teas. Both are delicate flavors that you are sure to love. Mints in particular come in a whole range of subtle flavors, and each has its own special characteristics. There are tea drinkers who find such variety in the world of mint that they can spend years simply enjoying the subtle nuances in different varieties of this one herb. If you would like to dabble in herbal flavors that are a little different, then consider growing herbs for more exotic flavors. Herbs such as lemon grass, anise, ginger, dandelion, and rosehip will give you flavor sensations that you can rarely find anywhere in the traditional grocery store beverage aisle. Once your herbs are ready to use, brewing your tea is not only a fun experience, but it can also be a sensory experience that you will come to crave as a part of your daily routine. In ancient Asian cultures, the brewing and serving of tea was so important that the process itself often became somewhat of an art form. Treat your daily cup (or pot) of herbal tea as if it were important, and you will find that it will taste so much better than you could imagine. Many herbs can be enjoyed either fresh or dried, depending on the herb itself and your particular tastes. If your plants do well, however, you may find that you have an abundance of delicious greenery that you want to dry for future use. The best way to dry your herbs is to lightly bundle them in such a way that permits the flow of air. Be sure to hang them upside down to dry, with the top of the plant hanging downward. This allows the essential oils to settle in the leaves of the plant instead of in the stem, resulting in a much more flavorful dried product. Do not settle for any ordinary pot for your brewing. Visit a store that deals in high quality brewing devices and get yourself a beautiful piece of pottery for brewing your special herbs. 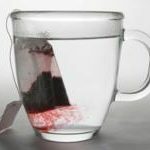 Most stores that sell kitchen implements carry a variety of tea infusers that are specially designed for the brewing of both dried as well as fresh herbs. Do not serve your tea in any old cup–serve it in a beautiful one that has real meaning to you. Take a hint from the ancients and turn tea time into a moment of relaxation and reflection instead of a rushed moment. Afterall, we are growing herbs and drinking tea because we want to SLOW DOWN for a moment. Why not always make that moment a meaningful one?